SKU: N/A. Categories: Painting & Painting Accessories, Watercolor Painting, Watercolor Paints. Tags: half pan, professional, watercolor, Watercolour, Winsor & Newton. Since 1832, when Henry Newton and William Winsor introduced the first moist watercolors to the world, much of Winsor & Newton’s reputation for supreme quality has stemmed from the Professional Watercolor range. 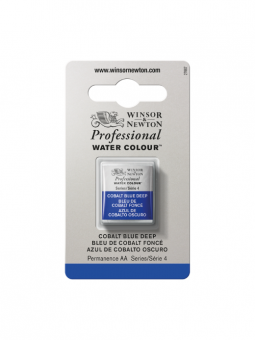 More than 170 years later, the original Winsor & Newton moist watercolor continues to be formulated and manufactured according to the company’s founding principles — to create an unparalleled watercolor range that offers artists the widest and most balanced choice of pigments with the greatest possible permanence. Through strict adherence to these founding principles, Winsor & Newton has achieved brilliance, transparency, and purity of color unparalleled by any other watercolor. For the 21st century, these key qualities are achieved through a combination of choice of raw materials, custom-made machinery, and expert formulation by experienced chemists and artists who have spent their working lifetimes formulating Professional Watercolor. Today, the Winsor & Newton Professional Watercolor range benefits from continued advancements in pigment technology and production methods, building on the company’s already high standards to produce even brighter, more transparent, and more stable colors. Equally important, many of the formulations remain the same — proving that they cannot be bettered!